Since 'Paranormal Activity's' debut two years ago, Oren Peli has quickly emerged as a nuevo master of horror. He's also the guy behind this year's sleeper hit, Insidious. In the short time Peli has been on the scene, his films have developed a signature: no frills, no music, little gore--just pure psychological horror. The previous paranormal films have been roller coaster-like. They start out slow, calm, and for a good portion of the film nothing happens, but when stuff does happen, hold on to your fuzzy britches, because you're in for a rough ride. Some may not like his subdued style, but this man has given the horror genre it's groove back. The new film is a prequel to the prequel-- origin to the origin. I'm hoping that prequels don't become the new sequels, but I think it's too late. It's already happened. You have George Lucas to thank for that. So Katie's back of course and Kristi is too. However, it's 1988 and Katie and Kristi are not the women we saw in P1 and P2--they're young girls. The third installment of the low-budget franchise is another cache of "found-footage." Gotta love those VHS camcorders. I don't know how many times we're going to see the Blair Witch-thing because it was old in 1999, but now it's really old. However, given the quality of Peli's movies, I'm willing to give it a chance. Watch the teaser trailer. 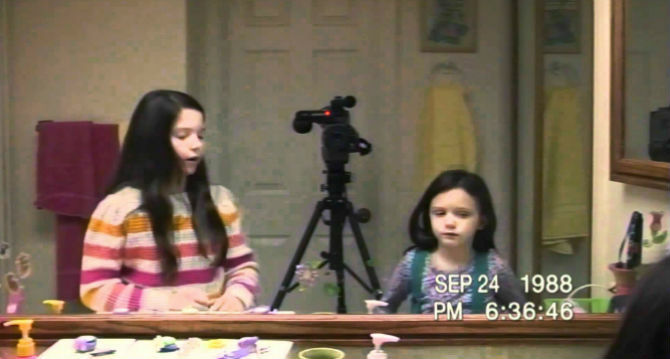 Paranormal Activity 3 is set for wide release on October 21st. I hated Paranormal Activity and refused to see the second. Insidious was good, but only because James Wan is an awesome director. I personally found nothing at all scary about this film. It was like watching an extended version of the Discovery Channel's A Haunting. The acting was bad and all the off camera noises were nothing more than what I used to do to torture my siblings. Really? I think you may like the second film better than the first. The first film was so low-budget that there wasn't much to it. I am however, getting tired of the video camera "left" recording thing. That's so old. I know what you mean. The whole found footage thing is overdone and they need a new schtick. I know that after the hype a lot of people backlashed at this series but I enjoyed it. I think the problem started when people or reviewers came out and said This is the scariest move ever,or scariest movie since...cause people will go in to watch the movie just to not be scared. That's no way to watch a film. @SlowD-- I agree. I think they hyped it in the wrong way. It's certainly not the scariest film ever. I am curious what is everyone's pick for the scariest movie ever? Also have published this new trailer here. Don't know why but the sequel for Paranormal Activity is always interesting to me. It's better watching this sequel than spend another Halloween with another Saw sequel. Insidious I didn't like and Paranormal was alright but I agree about the video camera recording thing. The first Paranormal Activity movie was really nice/scary! And to be honestly won't watch any further PA move ever again, at least not alone! @Jaccstev-- I agree. I hate the Saw movies. They're just awful. Did you see the new trailer for Dream House? @Angry Lurker-- What are some horror movies that you liked? @Magixx-- Thanks. I too was scared by the Paranormal movies. I thought part 2 was very scary. I almost fell out of my seat when the mother was dragged downstairs. I tried to comment on your blog, but for some reason it didn't go through. Perhaps it's IE that I'm using. I hate hate IE, which is why I use Chrome hwne I'm at home. @Cheshire-- They're definitely scary...in my opinion. I find supernatural/spiritual movies frightening. I think you'd enjoy them. @occhio sulle espressioni-- I too saw Paranormal Entity. I thought it was ok, but a pale comparison to P1 & P2. I liked the Paranormal films for their simplicity, but I understand why some folks aren't into it. This one looks like it'll be creepy but I didn't really like the first one & haven't seen the second one. I'm wondering if I should watch the second one so I can watch the third? @RealQueen-- If you didn't like the first one, you may like the 2nd. The 2nd one was better and had a bigger budget.